Tlos, situated in the Xanthos Valley, is one of the most important centers of the Lycian cities of the region. Tlos is known as the city where mythological hero Bellerophon and his winged flying horse Pegasus lived. 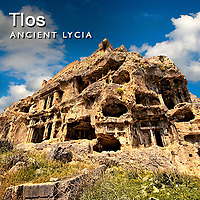 Archaeological excavations have shown that Tlos is the oldest city of Lycian Region. Tlos dates back to the time before 2000 B.C. The graveyard necropolis in the acropolis cliffs are filled with the typical Lycian house or temple type tombs. When Roman Byzantium fell, Tlos was occupied by the Ottoman Turks and remained inhabited until the 18th century.